Q. My ILL request was cancelled because they say we own the journal online. But I cannot find it. Can you help? To search for a journal in our collection, we recommend going to our library catalog (or the library home page, libinfo.uark.edu) and searching by the Journal Title. You'll notice that we have this journal from 1990 to the present online in Academic Search Complete and also MasterFILE Premier. 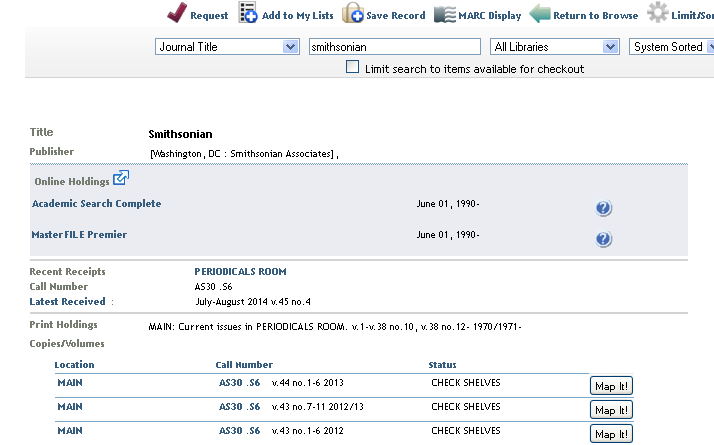 In addition, the section below those links show that we have this journal in print, on our shelves from 1970 on. The most current print issues (usually one year, sometimes two) are shelved in the Periodicals Room, while past issues are bound and are on the regular shelf at the call number, AS30 . S6. We also keep a separate list of electronic and print journals that you can check. See the link below. If you are still unable to find your journal article, please do contact us and we would be glad to help.